Hellenic Seaways covers destinations to the Cyclades, Sporades and Saronikos Islands with their Flyingcat fleet which consists of five high speed catamarans, all of which offer a comfortable and luxurious crossing. Flyingcat 1 built in Norway in 1991 (the oldest of the fleet) and carries 352 passengers. Flyingcat 3 built in England in 1998 has a passenger capacity of 360, Flyingcat 4 the newest, largest and fastest ferry in the fleet (built in 1999) and can travel up to 40 knots, is 55 metres long and can hold up to 440 passengers. Flyingcat 5 built in 1996 in Norway can accommodate around 330 passengers while Flyingcat 6 was built in Singapore in 1997 and caters for up to 337 passengers. 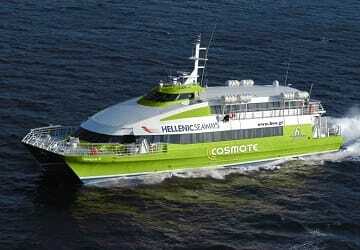 As these highspeed ships generally operate on shorter crossings, there are no cabin facilities available. Seating can be pre-booked and comes in a choice of Economy class 1, Economy class 2 (different lounges) and Business class. This guide covers numerous vessels so availability may depend on the service you are travelling on. Please Note: Whilst we have taken great care in making our Flyingcat guide as accurate as possible, onboard facilities, services and entertainment may vary depending on the date and time of year that you travel, facilities mentioned may change without notification and ferry companies reserve the right to operate vessels other than those mentioned at time of booking without prior notification. 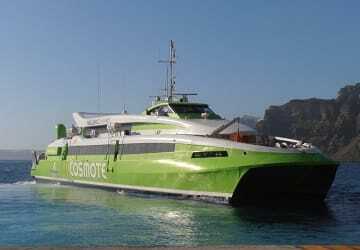 I was extremely impressed with Direct Ferries as well before our date for travelling our crossing time was changed but we were informed by phone message and also confirmed by a text message of the change. Unfortunately the sea was a bit rough and my husband and other passengers suffered from sea sickness. A member of the crew was empathetic and provided the necessary bags ! We found our trip on these ferries to be very good. We were travelling with a very young baby so we had loads of luggage, the staff all rushed to help us on both trips. The Flying Cat service between the Sporades islands is world class, comfortable, quick and after the traditional argy bargy negotiating continental non queuing; the ferry is one of the best services we've ever used. "Hellenic Seaways to Spetses from Athens"
"Ermioni - Piraeus, 4th Aug 2016"
Considerate staff and speedy travel. Thank you for all of the ferry services that enabled me to travel around the Sporades in comfort, and both safely and efficiently. Nothing beats island-hopping in Greece! Both ferry crossings ran on time with very friendly and helpful staff which made it a pleasure to travel. Flying cat was on time, clean and comfortable with good facilities. Staff were helpful. En fantastisk resa mellan öarna. Helt underbart väder. Katamaranen var punktlig vid alla resorna. Trevlig personal.